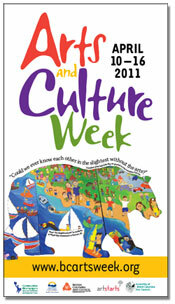 BC Arts and Culture Week is taking place April 10th to 16th, 2011 presented by ArtStarts and the Assembly of BC Arts Councils. Arts and Culture Week BCNow in its 12th year, this event turns the spotlight on the vital contribution that Arts and Culture make in learning and in life. Music, film, media arts, dance, books, theatre and visual art are a part of daily life. They inspire us, challenge us, broaden our horizons and help us to become informed, aware and contributing members of society. Events will take place across the province and are listed online by region: Vancouver Island/Coast (includes Vancouver Island, Gulf Islands and Sunshine Coast), Lower Mainland (includes Sea to Sky corridor, the Whistler area and the Fraser Valley), Kootenays, Interior (includes the Thompson Okanagan, Cariboo and Bella Coola), and North (includes the Queen Charlottes, Prince Rupert to Smithers, and the Peace-Liard). Some of these events are public and others are listed to provide examples of how schools are participating within their own walls through exhibits and performances. If your community organization or school is hosting an event that suits the BC Arts and Culture Week profile, you can submit it for listing online.